Ariana Grande's "7 Rings" logs a sixth total week atop the Billboard Hot 100 songs chart, as it rebounds from No. 2 to No. 1 on the list dated March 23. Meanwhile, Post Malone reaches the top five with "Wow." 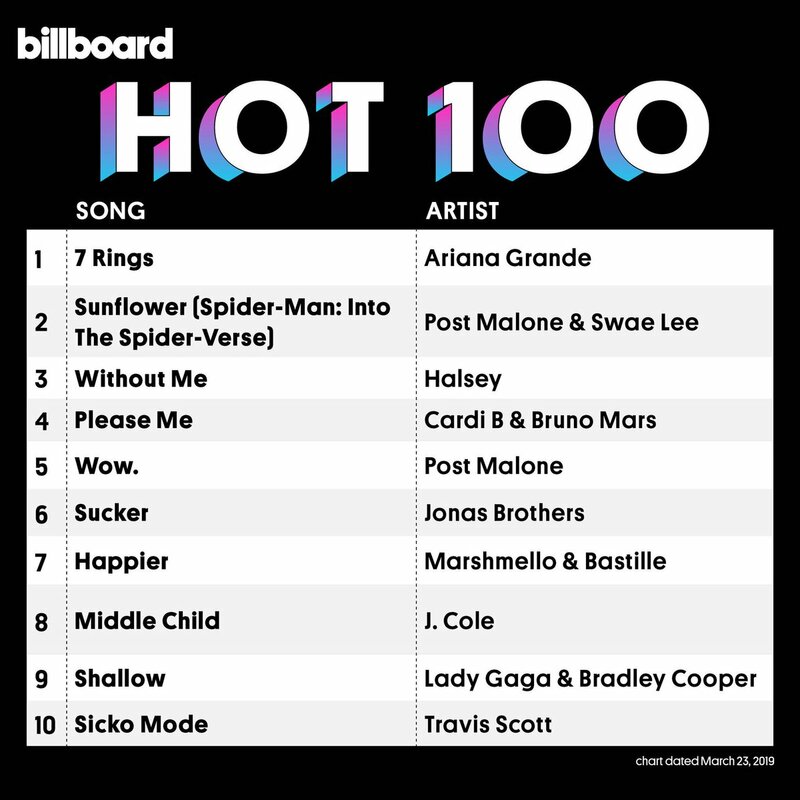 and boasts two songs in the top five for the first time, as the track joins "Sunflower (Spider-Man: Into the Spider-Verse)," with Swae Lee, at No. 2. Capping the Hot 100's top 10, Travis Scott's former No. 1 "Sicko Mode" holds at No. 10 as it spends its 32nd week (encompassing its entire run on the chart) in the top 10. The song is now a week from tying the overall top 10 longevity record. Juice WRLD claims his first No. 1 album on the Billboard 200 chart, as Death Race for Love debuts atop the tally. The set, which was released on March 8 via Grade A/Interscope Records, earned 165,000 equivalent album units in the week ending March 14, according to Nielsen Music. Of that sum, 43,000 were in album sales. Death Race logs both the biggest week overall, and the largest streaming week, for an R&B/hip-hop album in 2019. Of Death Race’s 165,000 equivalent album units earned in its opening frame, 120,000 were in SEA units, which translates to 176.44 million on-demand audio streams for its songs. Death Race nets the second-biggest streaming week of 2019 for any album, trailing only the debut week of Ariana Grande’s Thank U, Next (307 million on-demand audio streams, Feb. 23). Maren Morris nets her highest-charting album yet on the Billboard 200, as Girl bows at No. 4 with 46,000 units. Further, Morris logs the highest charting country album by a female artist in over five months. Carrie Underwood was the last female act to go higher with a country set, when Cry Pretty debuted at No. 1 on the Sept. 29, 2018-dated list. 1-1-2-2-2 None of her albums have seen this kinda success. I could honestly see ASIB soundtrack staying top ten for two more months looking at it's first run up to #10. The first quarter is traditionally way weaker than the 4th quarter. Second might have a bit of competition but not really that much. If ARUTW was a single then she could make moves but her label refuses. Now THIS is impressive af.